Biscuits from scratch can be part of Impromptu Entertaining??? Why yes they can!! These biscuits are a great addition to any meal and don’t take long to make. And the more you practice with biscuits, the easier they become. There is a rhythm involved that becomes second nature the more you make them. And if practicing means having delicious homemade biscuits around more often, how fun is that! These biscuits take about 45 minutes from start to hot, yummy finish. The cheddar and chives add a wonderful savory flavor that works perfect with soups, barbeque, and pork. In a large bowl, stir together the flour, baking powder, baking soda, salt, and sugar. Using your fingertips, rub the butter into the dry goods until it resembles cornmeal. You can also use a pastry cutter for this, but I find that using the fingertip method makes for a better biscuit. Make a well in the center of the mixture. In a small bowl, stir the chives into the buttermilk. Pour the buttermilk mixture into the well and add the cheese. Stir quickly to combine, just until the dough pulls away from the sides of the bowl. Turn out onto a floured work surface and knead gently and quickly until the dough is no longer sticky. Pat the dough into a square about 1/2 inch thick. Dip a 2 1/2 biscuit cutter (a glass works good too if you don’t have a cutter) in flour and then cut out 12 biscuits. Place biscuits on an ungreased baking sheet and bake for 12-15 minutes, or until a pale gold color. They look delicious. We call them scones in UK. And I agree it takes a bit of practice to do them well. But it’s well worth the effort! Hehe! 🙂 I think you might just love these then Laurie! Love biscuits, but io must confess to often using Bisquick when I make them. I like the idea of adding cheese to the mix. You know I’d eat a biscuit right now if I had one! I think I could eat biscuits almost everyday if my thighs would let me. 😉 The cheese really adds a great element to them too. 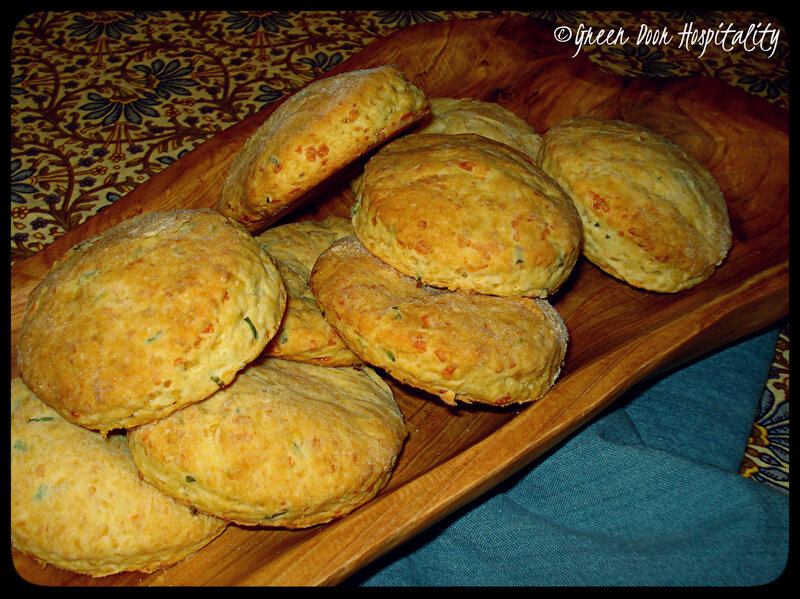 This entry was posted on January 21, 2014 by Jessica Romigh in Impromptu Entertaining and tagged Aged Cheddar, biscuits, buttermilk, buttermilk biscuits, cheddar cheese, cheddar chive biscuits, chives, Complete Entertaining Cookbook, flour, homemade biscuits, vegetarian, Williams-Sonoma.